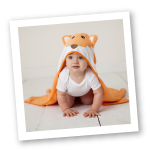 Luvable Friends Snap-Front Sleep N Play are great sleepers for your little one. Made of super soft, knitted cotton these infant sleepers are great for playtime or nap time, and they're machine washable for everyday use. The snap front closures make for easy dressing and diaper changing while the enclosed feet and long sleeves help to keep your baby warm and comfortable. Set includes fun prints and great coordinating colors. Look for our matching Luvable Friends Classic theme tee tops, bodysuits, scratch mittens, and caps!